You have to type in the name of the parish under which belonged the village your ancestors came from. Not the village name, but the parish. This is important to remember. How to find it? 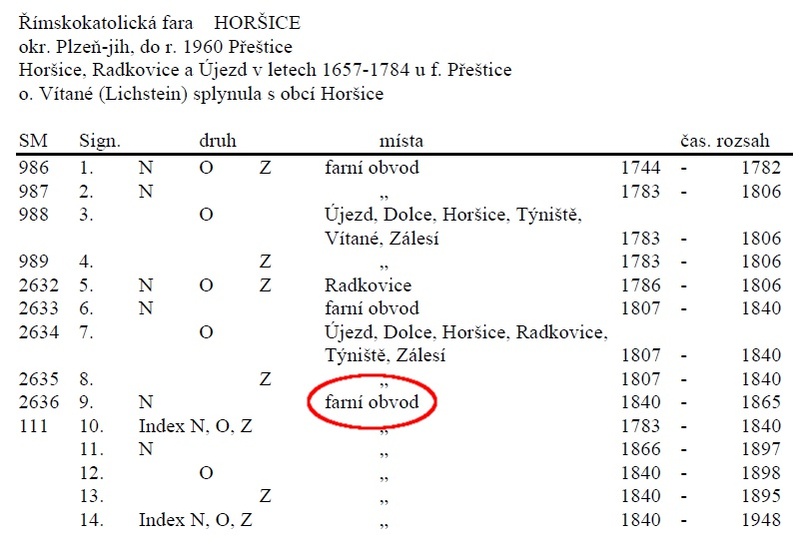 You can use Pilsen archives list of registries - unfortunately there are not all of the villages listed, because if there was one parish book for whole parish, there will be only "farní obvod" (whole parish) mentioned instead of name of the village (see below). But if you are lucky, the village you are looking for will be there. See an example below. If you are not able to find the village you can try GenTeam.at website. Registration is needed, but it covers whole area of the western part of ex-Hapsburg monarchy so it could be really useful. The website is available in English which is great. The most important part of all is Gazeteer where you can search for the village and find its parish. Then you just have to choose the parish book you need (based on information you already have). Good luck! And if you have any questions, just ask in the comments! Thanks for writing the tutorial! No, it's not needed to use the diacritics - both Nyrsko and Nýrsko give the same result. Some of the books also contain an index (indicated by a star, circle or cross in the table). Most are at the end of the book, although some books contain only indexes. Also, be aware that since parishes cover more than one town the book may be set up in "chapters". You will see records for one town for the dates listed, then the next town for those dates, and so on. So be sure to look at the top of the page you are viewing to see which town in the parish the records apply to. Some books have a page in front that lists the towns in the parish and what order they appear in the book. Finally, I was unable to print images from the site, but was able to save them using my snipping tool on my computer then save them as jpeg files. Do you know if/when the Zebnice parish will be digitized? All roads seem to be leading there for me at this time. Is the only option to search in person for this area? I appreciate any information you have. Well, it will be probably digitized next year (according to current speed of digitalization). Right now it's possible to search only personally, directly in the State Regional Archives in Pilsen. Your information is very helpful. Thank You. Is there a publishing schedule we can look at? 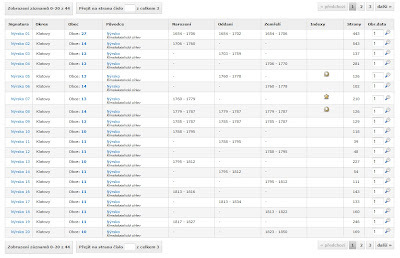 Do you know when Zelená Lhota is expected to be digitized and published on ActaPublica.eu? Thank you so much for the information on your blog! 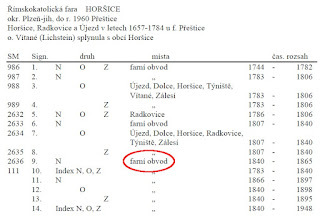 My mother and I have been researching our Bohemian ancestors on the websites for the Pilsen and Litomerice Archives (we don't speak German, but have found hundreds of birth, marriage, and death records and are working on translating them). And we are going to the Czech Republic to do genealogy in October (I am so excited, I have never been outside the USA before). My parents have been to the Pilsen Archive before and last time they were there they saw people looking at large envelopes and boxes of papers and photographs. The only records we have ever seen are the birth, marriage, and death registry books. Are there other kinds of records in the archive? 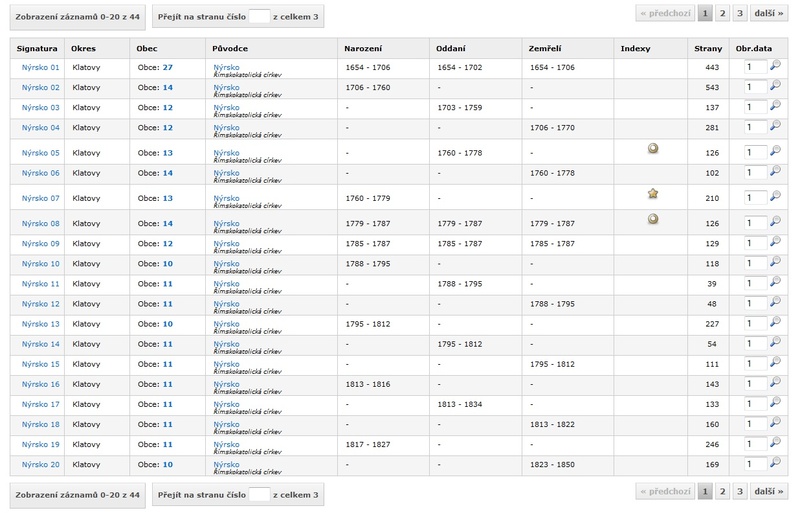 Someone told me I should look on the archive websites to find a list of fond/funds which would list different kinds of records in the archives, but I haven't been able to find any lists for these two archives that show any other types of records. a yellow box pops up and disappears rapidly. what is it for? Today this yellow box is blank and just sits there. What to do? I just used your suggestions to find the Parish of the village of Bohy, in Plzen North and it worked like a charm. I also found the parishes for Kopidlo and Ceska Briza. Thanks.